The SEENET-MTP Committee meeting will be held in Bucharest on 2nd and 3rd of February 2017. There will be a number of joint meetings with: Executive Committee of European Physical Society (EPS), EPS-CEI (Committee of European Integration), Executive Committee of the Balkan Physical Union (BPU) and with presidents or representatives of selected EPS Member Societies. The whole will take place in Bucharest (Romania) from February 1st to 4th, 2017. The president of EPS Christophe Rossel and president-elected Rüdiger Voss will give introductory talks. 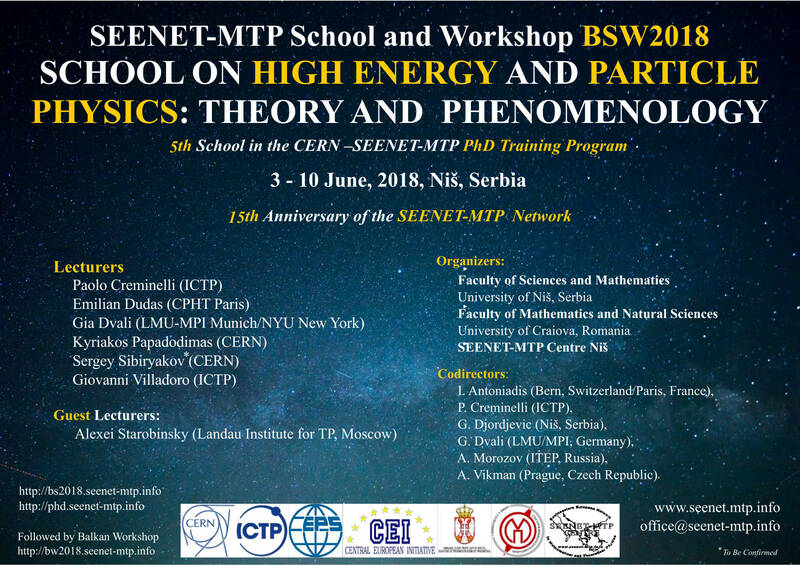 The SEENET-MTP committee members will consider report on activities in 2016, plan of events in 2017, the new bilateral agreement with CERN on joint training PhD Program and cooperation with EPS on integration in European physics research area. The XXV International Conference on Integrable Systems and Quantum symmetries (ISQS-25) to be held on June 6-10 Prague, Czech Republic. Spectral asymptotics of Quantum integrable systems. The XXV International Conference on Integrable Systems is one of a series of annual meetings held at the Czech Technical University since 1992 and is devoted to problems of mathematical physics related to the theory of integrable systems, quantum groups and quantum symmetries. During the last 3 years each of the conferences gathered each year around 100 scientists from all over the world. The workshop is organized the Czech Technical University in Prague. More information are available at the website of the conference. The 32th International Colloquium on Group Theoretical Methods in Physics (Group32) will be held at Czech Technical University in Prague, Czech Republic, from Monday 9th July until Friday 13th July 2018. The ICGTMP series is traditionally dedicated to the application of symmetry and group theoretical methods in physics, chemistry and mathematics, and to the development of mathematical tools and theories for progress in group theory and symmetries. Over the years, it has further broadened and diversified due to the successful application of group theoretical, geometric and algebraic methods in life sciences and other areas. We are pleased to announce 15th edition of the annual TIM International Physics Conference, TIM15-16. The event is hosted by the Faculty of Physics of the West University of Timisoara (Romania) and will take place between 26th and 28th of May 2016. More information about the Workshops will be provided soon. TIM is one of the foremost physics conferences in Romania and brings together scientists, in several fields, from national and international institutions. You can find out more about the conference and submit an abstract at the conference website. The deadline for abstract submission is the 15th of April 2016. The meeting will be organized by the University of Craiova, Romania and the SEENET-MTP Network, with main financial support of UNESCO Venice Office and Romanian Space Agency (ROSA).